The Third Lake Ridge historic district encompasses the oldest sections of the Marquette neighborhood. It extends roughly from Blair Street to the Yahara River and from Williamson Street to Lake Monona. It is an area noted for its variety of building types, including churches, a tobacco warehouse, corner groceries, tiny cottages, imposing mansions and a railroad depot. It was a place where a diversity of people - Germans, Norwegians, and Yankees - lived, worked and shopped. The historic district designation came about as part of a multi-faceted revitalization campaign undertaken by the Marquette Neighborhood Association, which included such things as beautification, economic development, zoning studies and traffic redirection. The Third Lake Ridge was designated Madison's second historic district in 1979. The First Settlement neighborhood just southeast of the square was the home of Madison's first residential settlement. In 1837 Eben and Rosalie Peck built a boarding house on South Butler Street to house workers who would build the first state capitol here. Their log cabin was the first occupied residence in Madison. As the nineteenth century progressed, more modest frame houses were built in the area, with finer brick residences sprinkled throughout. The neighborhood remained fairly stable until after World War II when development of the downtown began to encroach on the area. 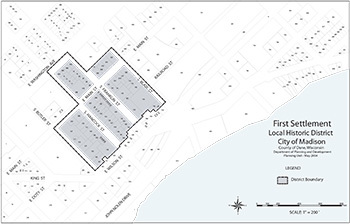 The construction of the GEF buildings for state government severely impinged on the desirability of the area, which was marked in city plans of the 1960s and 1970s for complete redevelopment. In the late 1970s, though, pioneer downtowners began to move back to the area and restore the simple houses of a bygone era. 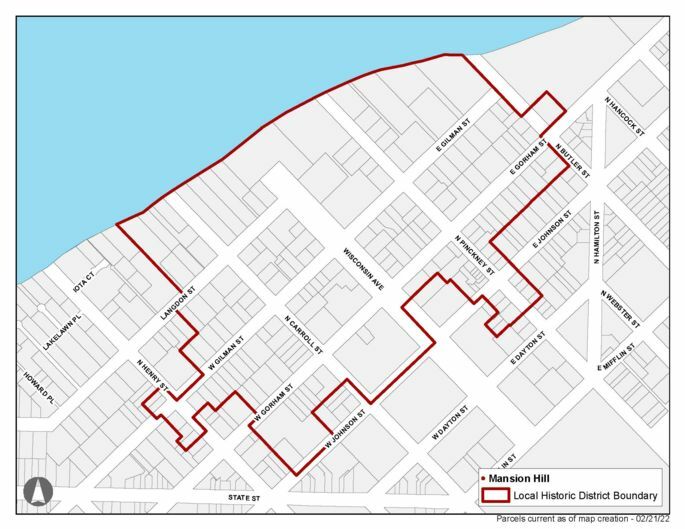 In 2002 residents succeeded in having the Common Council designate the area as Madison's fifth historic district.